Physical servers with the flexibility and control of virtual machines. Bare Metal servers are fully integrated into CenturyLink Cloud, allowing you to create and manage physical servers alongside virtual instances. Provision Bare Metal on and off as needed with pay-as-you go flexibility, and host a wide range of apps from a unified interface. Ideal for compute-intensive applications like databases, analytics jobs, grid computing, and other workloads requiring consistent performance. Compute and storage is isolated to ensure a high level of performance for compute-intensive workloads or “batch” jobs needing bursts of compute power for a short time. In traditional data center or colocation environments, the provisioning timeline is measured in days or weeks. Bare Metal servers are available in an hour or less for no organizational downtime. You are billed hourly for the life of the server, so you only pay for what you use. Spin up machines when you need them and de-provision when you're done. 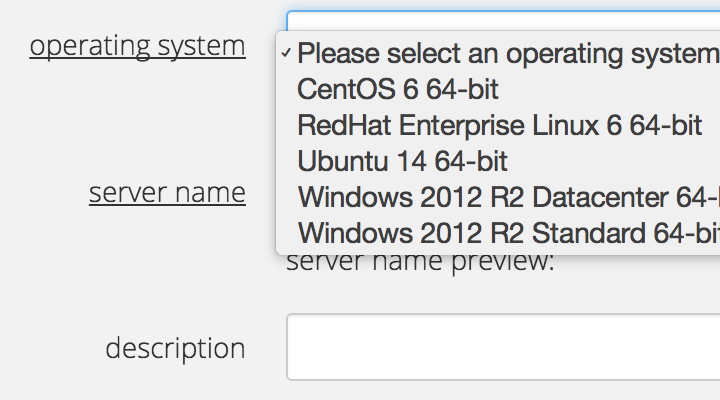 Select from a variety of configuration options designed to meet different compute requirements. Provision servers with user-defined firewall polices. Fully encrypted local storage isolates and protects data. Use Cloud Network Services – our secure, high-performance transit network – to connect Bare Metal servers with other infrastructure deployments to create hybrid environments. 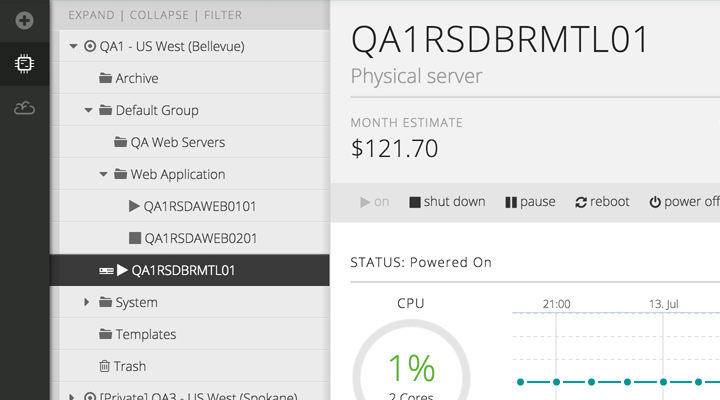 Configure, run, and manage Bare Metal servers through the Control Portal. Leverage CenturyLink Cloud’s REST API to create or decommission physical servers and manage power operations. Deploy physical and virtual servers side-by-side in the same Group and VLAN; this dramatically simplifies administration of hybrid solutions. Bare Metal Servers are perfect for big data workloads. Customize, provision, and manage physical machines fast with on-demand flexibility via the Control Portal or API calls. Combine the compute power needed for data mining and analytics. Give developers an isolated environment with all the benefits of VMs. Use containers (like Docker) to house micro service architectures. Scale apps running in containers deployed on Bare Metal and provision through API. Combine physical servers with cloud and gain operational advantage through a unified platform to operate infrastructure faster. Many enterprise apps running on-premises or in traditional hosting environments are not well-suited to virtualization. For example: apps with licensing restrictions, or that carry compute-intensive workloads, such as data analytics, caching and indexing. Such apps are ideal for Bare Metal, where you get the benefits of single-tenancy at significant cost saving. Customize a hybrid cloud solution through unified management of resources. 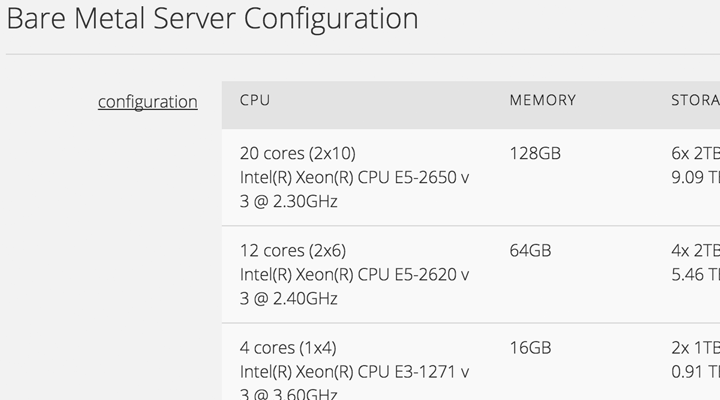 Combine Bare Metal Servers with elastic Cloud Servers to manage and scale three-tier applications. Web tiers get the agility and elasticity of virtual environments, while application and database tiers get performance and isolation. ** 500 USD trial credit excludes Bare Metal servers, Cloud Application Manager, Dedicated Cloud Compute, CenturyLink Private Cloud on VMware Cloud Foundation and Managed Disaster Recovery Service. Limit one trial account per customer. Trial credits expire after 90 days. A valid credit card is required to activate your trial account. Refer to our CenturyLink Cloud Agreement , Supplemental Terms and Acceptable Use Policy for other terms and conditions. For further information, read the CenturyLink Cloud Free Trial FAQs. Prices are for United States data centers only. Not all configurations are available in all data centers. Ressourcen werden stündlich berechnet, selbst wenn Bare Metal Server abgeschaltet sind. Monatliche, auf 720 Stunden basierende Schätzungen stellen den globalen Durchschnittspreis basierend auf verfügbaren Standorten dar. Die Kosten für die Betriebssystems-/Softwarelizensierung sind nicht inbegriffen. Click below to check actual pricing and geographic availability. Die CenturyLink Cloud ist zuverlässig, sicher, robust und global. Sie wurde für aktuelle wie künftige geschäftliche Ansprüche Ihres Unternehmens entwickelt. Dauerhafte, leistungsstarke Storage für jedes Unternehmensszenario. Leichtes Hinzufügen von Backup- und DR-Kapazitäten, wo erforderlich.